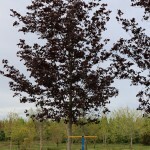 A dense, rounded tree with deep maroon foliage; this tree is very similar to Acer p. 'Crimson King'. It is considered by many to have better cold hardiness. The leaves emerge about two weeks later than Crimson King. It is tolerant of a wide range of soils, heat and drought and performs best in full sun. Selected in 1963 in Oregon.